Before his accession to the throne at age 62, he served as crown prince for over 42 years. During the long reign of his father, King Christian IX, he was largely excluded from influence and political power. Frederick was born on 3 June 1843 in the Yellow Palace in Copenhagen as Prince Frederick of Schleswig-Holstein-Sonderburg-Glücksburg, a junior male line of the House of Oldenburg, which was descended from Christian III of Denmark and which had ruled as non-sovereign dukes in Schleswig-Holstein for eight generations, including Frederick's grandfather. Frederick's parents were Prince Christian of Schleswig-Holstein-Sonderburg-Glücksburg and Louise of Hesse-Kassel. In 1853, his father was chosen as the heir presumptive to the Danish throne, because Frederick's mother, Louise of Hesse-Kassel, was a close relative of the last Danish king of the Oldenburg main line (the other heirs of the House of Hesse renounced their claims to the Danish throne in favour of Louise and her husband). Accordingly, Frederick became a Prince of Denmark in 1853. After his confirmation in 1860, Frederick was given a military education. 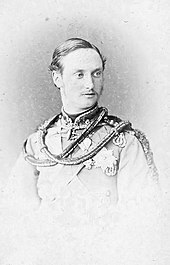 In 1863, Prince Frederick was sent to do studies at the University of Oxford but when his father ascended the throne in November that year, he became Crown Prince and returned to Denmark. As Crown Prince of Denmark, he was given a seat in the State Council and subsequently assisted his father in the duties of government. In 1864, he formally took part in the Second Schleswig War against Prussia. Louise of Hesse wanted her eldest son to marry as well as her two daughters, Alexandra and Dagmar, had. Queen Victoria of the United Kingdom had two yet unmarried daughters, Princess Helena and Princess Louise, and Louise tried to marry Frederick to one of them. However, the British Queen didn't want her daughters to marry the heirs to foreign crowns, as this would force them to live abroad. She preferred German princes who could establish homes in the UK. In addition, Victoria had always been pro-German and another Danish alliance (Frederick's sister, Alexandra, had married Victoria's eldest son, the Prince of Wales), would not have been in line with her German interests. 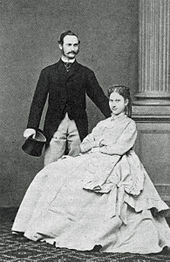 In July 1868, Frederick became engaged to Princess Louise of Sweden, the 17-year-old only daughter of King Charles XV of Sweden and IV of Norway. Princess Louise's family was related by marriage to Napoleon Bonaparte. She belonged to the Bernadotte dynasty, which had ruled in Sweden since 1818, when the founder, Jean-Baptiste Bernadotte, one of Napoleon's generals, was elected crown prince of Sweden in 1810 and later succeeded the throne as Charles XIV of Sweden in 1818. He married Désirée Clary, who had once been engaged to the French Emperor. Charles XIV's son, Oscar I of Sweden, married Josephine of Leuchtenberg, granddaughter of Napoleon's first wife, the Empress Josephine. King Oscar I and Queen Josephine were Princess Louise's paternal grandparents. The marriage was suggested as a way of creating friendship between Denmark and Sweden. The two countries were in a tense situation after Sweden had not assisted Denmark during the war with Prussia in 1864. Frederick and Louise had met for the first time in 1862, but in 1868 Frederick was invited to Sweden to get to know Louise, and their meeting was described as a success. They became engaged the same year. She was the first Swedish princess to be married into the Danish royal house since the Middle Ages, and the marriage was welcomed in all three Scandinavian countries as a symbol of the new Scandinavism. Crown Prince Frederick and Louise of Sweden married at the Royal Palace in Stockholm on 28 July 1869. The couple resided at Amalienborg Palace in Copenhagen, spending the summers at Charlottenlund Palace north of the city. They had four sons and four daughters. The marriage was not a happy one, nor did it have any effect on the relationship between the two countries. Frederick became king of Denmark as Frederick VIII on Christian IX's death on 29 January 1906. He was 62 years old at the time and had been Crown Prince for 43 years. 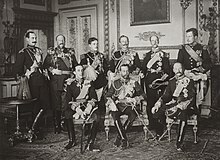 In many ways Frederick VIII was a liberal ruler who was much more favorable to the new parliamentarian system than his father had been. Because of his very late accession to the throne he had only a few years to show his ability and he was weakened by ill health. On his return journey from a trip to Nice, King Frederick made a short stop in Hamburg, staying at the Hotel Hamburger Hof. The evening of his arrival on 14 May 1912, Frederick (incognito) took a walk on the Jungfernstieg. While walking he became faint and collapsed on a park bench and died. He was discovered by a police officer who took him to a Hafen hospital where he was pronounced dead. His cause of death was announced as a paralysis-attack. He was interred with other members of the Danish royal family in Roskilde Cathedral near Copenhagen. The royal families of Denmark, Norway, Belgium and Luxembourg are descended from King Frederick VIII. Denmark comes naturally, Norway's family goes through the line of his son, Prince Carl, and the families of Belgium and Luxembourg are descended from his daughter, Princess Ingeborg of Denmark. King Frederick VIII Land in Greenland is named after him. Frederick VIII was Colonel-in-Chief of The Buffs (Royal East Kent Regiment) and received several orders. ^ "No. 27292". The London Gazette. 8 March 1901. p. 1647. Wikimedia Commons has media related to Frederick VIII of Denmark. "Frederick VIII." . Encyclopædia Britannica (11th ed.). 1911. Generations indicate descent from Duke Philip of the elder Glücksburg line; generations beyond 6 start anew with Duke Friedrich Wilhelm of the junior line, a 6th generation descendant of Princess Augusta. This page was last edited on 16 April 2019, at 07:22 (UTC).